Claire Wineland, a 2014 winner who is now 21 years old, was recently named Glamour Magazine’s 2018 College Women of the Year Grand Prize Winner. One of just ten winners featured in the June/July edition of the magazine, Claire was honored for her continuing work with Claire’s Place Foundation, a non-profit she founded as a 13-year-old to support those living with Cystic Fibrosis. Glamour also applauded her work to challenge stereotypes about terminal illness via YouTube and other channels. Congratulations, Claire! When we honored Ryan Hreljac back in 2002, he was the 11-year-old founder of Ryan’s Well Foundation and had raised a half-million dollars to provide water wells for 70 African villages. Today, Ryan works full-time for his foundation, which has improved the lives of nearly one million vulnerable people through the construction of 1,277 community-led water projects and 1,251 latrines. Ryan’s Well has strengthened the capacity of over 1,000 communities in 16 countries and continues to engage the support and expertise of local partner organizations. Jeff Hanson won the prize in 2011, at age 17, for painting and selling original artwork to support charitable foundations. Now 24 years old, Jeff continues to “change the world through art.” He has raised nearly $3.5 million for various organizations including children’s hospitals across the U.S. and an orphanage in South Africa. His paintings grace walls around the world, including those of Sir Elton John and Warren E. Buffett. His next goal? Raising $10 million by age 30. Our young heroes have also been busy writing books! Consider adding these gems to your summer reading list. Ask about them at your local bookstore. They’re also available through Amazon. PhilanthroParties! A Party-Planning Guide for Kids Who Want to Give Back, by Lulu Cerone (2013 winner), Aladdin/Beyond Words, 2017. Amica’s World: How a Giant Bird Came into our Heart and Home, by Washo Shadowhawk (2005 winner), Microcosm Publishing, 2016. Breakthrough: How One Teen Innovator is Changing the World, by Jack Andraka (2013 winner), Harper Collins, 2015. Do Good Well: Your Guide to Leadership, Action, and Social Innovation, by Nina Vasan (2002 winner) and Jennifer Przybylo, Wiley/Jossey-Bass, 2013. A Random Book about the Power of Anyone, by Talia Leman (2006 winner), Free Press (a division of Simon & Schuster), 2012. 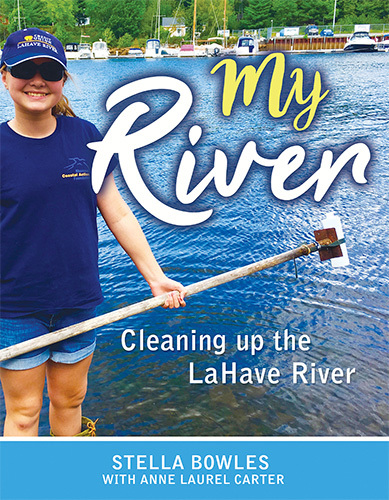 My River: Cleaning Up the LaHave River, by Anne Laurel Carter and Stella Bowles. Stella won the Barron Prize in 2017 for her work to clean up the river outside her home in Nova Scotia, Canada. Available September 2018!